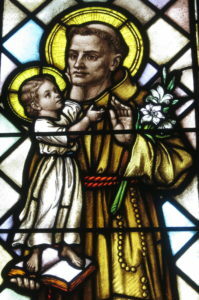 St. Anthony of Padua is one of the most popular and beloved saints. It may be a surprise to some that the finder of lost items is also a doctor of the Church, even given the title of Evangelical Doctor as proclaimed by Pope Pius XII in 1946. His South American devotees, who call him St. Anthony of Lisbon after his birthplace, at first resisted his new title of doctor, fearing that it would disconnect him from the common folk. St. Anthony—who was born August 15, 1195 and died June 13, 1231—was indeed a learned man of aristocratic birth, but he preferred humility to the appearance of erudition and preaching to the common people over university privileges. Having studied as an Augustinian in Spain and then transitioning to life as a Franciscan in Italy, many of his fellow Franciscans thought washing dishes to be his greatest skill. It was only when St. Anthony was asked to preach for a special gathering that his gifts were discovered. He was sent to teach at the University of Bologna where he received many accolades, but he chose only to remain in academia for a time. He was also entrusted by St. Francis with the formation of the Franciscans. St. Anthony’s reputation as finder of lost items actually comes from this time, when he prayed and found his book of annotated psalms which had been taken by a wayward novice leaving formation. Not only did the book return, but also the novice to the Franciscan order. St. Anthony travelled about to preach and thousands would gather to hear him. His preaching was so popular that often he could only preach outdoors. A collection of St. Anthony’s sermons is preserved to this day. While we cannot hear the inflection of voice or the use of emotion with which he was said to stir the hearts of penitents, we can glimpse some highlights of his thought. He was a biblical scholar. His teaching was centered on Scripture, and especially the gospels. This is why he is called the Evangelical Doctor. He is even quoted saying, “Theology is the science of Sacred Scripture.” Centuries later, the Second Vatican Council would teach, “the study of the sacred page is, as it were, the soul of sacred theology” (Dei Verbum, no. 24). The Catechism of the Catholic Church (no. 117) also reaffirms the spiritual senses of Scripture—moral, analogical (speaking of Christ), and anagogical (speaking of heaven). St. Anthony, following the Church Fathers whom he had studied deeply, immersed his preaching in those mystical and symbolic ways of interpreting Scripture. He saw throughout the Bible a “concordance” of events, as he termed it, which communicates a unified message and culminates in Christ. “O poverty! O humility! The Lord of all is wrapped in a scrap of cloth! The King of angels lies down in a stable! Blush, insatiable avarice! Be ashamed, human pride!” (The Nativity of the Lord, 7). St. Anthony, in the thirteenth century, was ahead of his times in articulating numerous orthodox theological doctrines. According to Huber, in a time when the Immaculate Conception was not universally understood, St. Anthony taught that the Blessed Virgin was “a throne of God made of pure ivory” and that she was “without the ardor of concupiscence and lily-white in her innocence”. He believed that she must have been preserved from original sin in order to be worthy to bear the Son of God. “This our glorious Esther is today led by the hands of the angels to ‘the chamber of king Assuerus’, ‘the heavenly bride-chamber in which the King of kings, blessedness of the angels, sits upon a starry throne,’ Jesus Christ, who loved this glorious Virgin ‘above all other women’, her from whom he took flesh, who found grace and mercy in his sight above all women. O immeasurable dignity of Mary! … truly, more excellent still was the grace of blessed Mary, who bore a Son to God the Father; and therefore she has been found worthy of being crowned this day in heaven” (Sermon on the Assumption). “Yes, indeed, Peter, as a mere man was an ignorant and illiterate person, but sitting upon his cathedra he was most wise” . St. Anthony recognized that Peter was given a singular gift by God to interpret the true Faith. St. Anthony, the Evangelical Doctor, was steeped in the prayerful study of Scripture in light of the Church Fathers. His main interest was in stirring hearts to the love of God and his main tool was the witness of his life, which stood to support the unique skill of his teaching and preaching. What about the Old Testament Saints? Michael J. Ruszala is the author of several religious books, including Lives of the Saints: Volume I and Who Created God? A Teacher’s Guidebook for Answering Children’s Tough Questions about God. He holds a master of arts degree in theology & Christian ministry from Franciscan University of Steubenville. He has served for a number of years as a parish director of religious education, parish music director in the Diocese of Buffalo, and adjunct lecturer in religious studies at Niagara University in Lewiston, NY. For more information about Michael and his books, visit michaeljruszala.com.